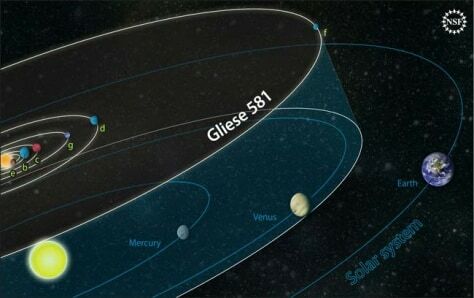 The orbits of planets in the Gliese 581 system are compared to those of our own solar system. The Gliese 581 star has about 30 percent the mass of our sun, and the outermost planet is closer to its star than we are to the sun. Gliese 581d might be able to sustain liquid water on its surface.